Before you set up a training course, first check the location and make a note of each person or thing (cars running, spilled chemical, garbage) that might contaminated the area. In an actual response this is called doing an assessment of the scene and should be done visually as you approach the location. Findings should be noted on paper for later planning. Doing a visual assessment helps you to know your dangers before placing your dog and self in a bad situation. Make a mental note of any dangers you might encounter such as a busy roadway or a train track your dog might lead you across. After checking the area to determine it is safe and noting the contaminants then check the wind direction and weather conditions (more on these factors in another lesson). In training novice dogs always start the dog into the wind so the scent is blowing towards the dog to give the dog the best chance in picking up the scent. Pay attention to the location and use what may be available for hiding spots and turns, such as buildings, picnic tables in a park or a large tree across the cleared field. This dog training lesson is easy to do at home and teaches a dog to use an article belonging to the missing or lost person to find that person. In dog work this is considered and often called scent discrimination because the dog learns to smell the "scent article" and look only for that scent or person. It is very Important to not contaminate the article with your own and other scents. 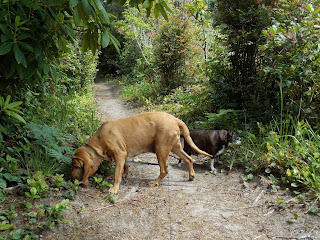 Read More (click) and go to the free lesson page for many posts about scent and how-to teach working dogs tracking or pets to help its family locate missing family after a disaster. You can do this lesson indoors or outside with or without a leash, depending on the dog. Start with a person your dog knows and hold your dog by its collar as the person slowly runs and waves at the dog to a hiding place that is easy to find and with only one turn away right now. Hold the scent article, the person's sock, to your dog's nose, say "Smell" and then turn your dog loose and say "Find so and so" use the person’s name, follow your dog to the person. Your dog, no matter what age will attempt to find them. If the dog has a hard time at first it is okay for the person who is hiding to call the dog or encourage the dog to find them so the dog gets the idea. Later the person will not speak or move but hide. 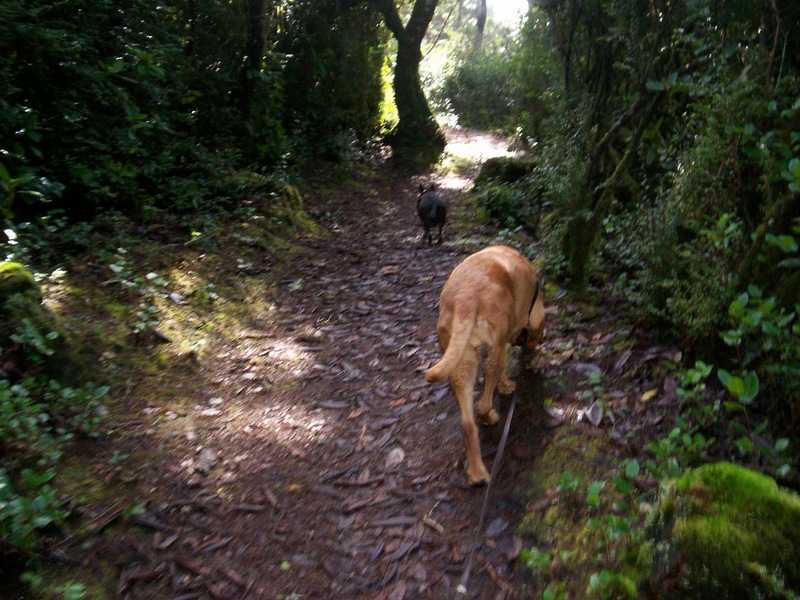 You will learn as we get further in training to read your dog's clues, in the meantime, learn to watch your dog's moves and body language for indications and reactions that lead to the trail or person. 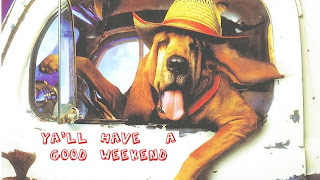 If the dog does not go fairly quickly to the person then encourage the dog to go with you and show the dog with excitement how fun it is to find the person. When they find the person, praise, praise, praise by you and the person shower this dog with attention and they will be so happy to do this again, you'll hardly be able to hold him. Here is Bo taking scent from the scent article in a plastic bag before we start on a wooded trail looking for a person who is hiding. Bloodhounds often put their whole nose in the scent bag. A leash is not needed at first with your pet dog if you train in a fenced yard or with a dog who is use to free roaming. 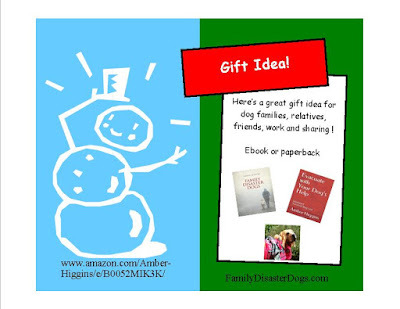 Check out the Family Disaster Dog book for all the lessons in paperback and kindle! 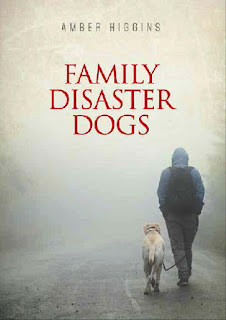 Family Disaster Dogs-Your Dog Can Rescue You! What is a Family Disaster Dog? It is Your Dog trained to Find and Rescue You! The Family Disaster Dog Book shows you how easy a pet dog of any age, size or breed can be your very own Search and Rescue Dog! Dogs do these skills every day without us noticing. Teaching your family dog to come to your aid during an emergency is not as difficult as one might think. This site and book shows you how Any size dog from the little Chihuahua to the Great Dane can help its owner survive..and they find you every day already when they want to play or eat so why not learn what else they can do to help you ! One of our biggest fears and chores during a disaster is losing or finding a loved one and every dog has the ability to find its family members or friends. We, as dog owners, only need to learn how to use the natural ability of the dog to the full advantage during emergencies. These fun and easy lessons are tailored for the family to learn rescue skills in the comfort of the home during daily activities by former Search Dog Instructor Amber Higgins who spent over a decade breeding and training AKC Bloodhounds for nationwide Search and Rescue FEMA volunteer work along with German Shepherd Dogs. Ask any dog to find family members and friends who are lost or missing ! Learn how your dog can be a messenger dog ! How any size dog can carry extra supplies if you have to evacuate. Learn how to pack and use a Dog Bug-out Bag with 3 days of survival supplies for you and your dog. Teach your dog to alert you to danger and warning sirens with these easy at home lessons. If you are trapped in an earthquake,your dog can find you, dig you out or bring you first aid until rescuers arrive ! Send your dog for help or to your partner or child on command, it's easy to do with these lessons. Teach your dog to bring you items by name and much more ! Teach the whole family how to use the family dog as their own search and rescue dog in tornado, floods, earthquakes and to find lost loved ones ! Don't have a dog then this book is a great gift for a friend or neighbor who has a dog and they can come to your rescue too ! 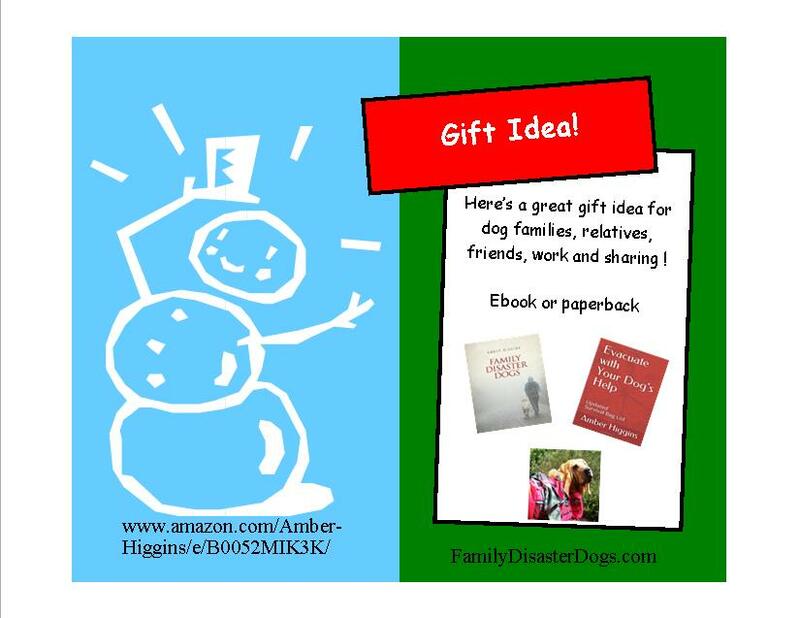 Use this book and the site or ask for help from me to Form a neighborhood Family Disaster Dog group at church or clubs to help neighbors until emergency response arrives ! 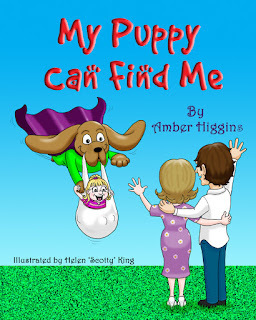 Coming soon "My Puppy Can Find Me" children's picture books by Amber Higgins for young children to learn what to do if they are every lost. With illustrations from UK Cartoonist Helen "Scotty" King ! Click and see how she can make your dog as a cartoon for gift ideas! Dogs are a real blessing to a family and bring so much joy and happiness, so it’s no wonder that most children will at some point bring up the question of when they’re getting a dog. As much as dogs are cute, loyal and lots of fun, they’re also a huge responsibility, and this is obviously something that children don’t understand, so it’s important that this is something you don’t allow yourself to be pressured into if a dog is not something your lifestyle or circumstances are suited to. For example, if you’re someone who has to travel a lot for work, or just who likes to travel a lot in general, then even if you’re someone who completely loves animals and has the space for a dog, it’s simply not going to be a suitable lifestyle because pets - dogs especially require a good routine and stability, plus it’s also not fair to them if you’re constantly gone or they have to go and stay with your friends and family since they need to feel secure that they have a home. In this post, we’re going to share with you some tips on what to do when your kids are pressuring you to get a dog, and some reasons why you may want to consider hearing them out. One of the most common reactions among parents who are faced with the “can we get a dog?” question is that they’ll be left to take care of it and walk it, which is often the case. However, this doesn’t have to be the case for you, and can actually be a prime opportunity for you to teach your children about responsibility, which will serve them very well later in life. Of course it’s not going to be as simple as just telling them that they will have to care for the dog or at least play a big role in helping, but how you approach the issue with your children before getting a dog will be up to you and how you know your children to be. 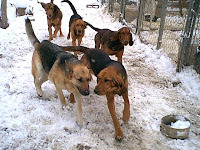 For example, telling them about the consequences of what might happen should they not keep their end of the deal and that the dog may have to go away and could end up with a not so good owner or even in a shelter are good ways to teach them their actions are important and they have consequences. It’s not something you’re lying about either, since this is actually one of the heartbreaking things that happen when families get dogs without being ready or properly prepared to look after them. Many parents are afraid of bringing a dog into the house because they fear that their children will pick up germs and get sick. However, the opposite is actually true, and exposure to dogs can actually boost their immunity. Of course, it’s always crucial to practice good hygiene and use common sense when dealing with dogs, such as washing hands, etc. But keeping your kids totally shielded from any germs or bacteria can actually cause them to get more things like colds and flu since their immune system won’t have built up natural resistance to it. Dogs are well-known to be some of the best companions around. They may not speak, but it’s somehow as if they just know the right things to do to make us feel better. This can be especially great for kids who deal with loneliness, or even an only child. Dogs are often brought in as companions to places like retirement homes for this very reason, so if your child seems to be isolated or you worry about them spending too much alone, then a dog could be just the thing to bring them out of their shell. Between the multiple daily walks, playing fetch in the garden and simply chasing each other around the living room, your dog will certainly keep your child active, which is never a bad thing for children - especially these days where they all seem more interested in starting at an iPad for hours on end instead of experiencing real life. Dogs are notoriously protective of their owners and families, so if you want to feel like your child is that little bit more safe, especially when walking somewhere on their own, then a dog could be a perfect way to create some security since they will do anything to protect your child and especially if it’s a larger dog such as a German Shepherd, then they can also be quite intimidating, so people are less likely to try and come near a child with a dog like that. Many studies have shown that dogs and cats can rapidly and drastically boost the mood of someone who’s feeling low or who is suffering from depression or anxiety. They are very intuitive animals and just always seem to know what’s wrong and what to do, so if you worry about your child in any of these ways, then a dog could be the ideal companion to help them feel better. If dogs are known to be anything it’s that they’re completely selfless and show unconditional love in all situations, so if these are things you want your child to learn about and exhibit as they grow up, then a dog through its actions will teach them this better than any book or talks ever will. Another thing that dogs are notorious for is their complete loyalty to their owners, and loyalty is something that’s a very important trait for your children to learn as they grow up, so if you want to show them how important this is and how to display it, then getting a dog could actually be an ideal way to teach them this very useful life skill. Since dogs teach children a great deal of responsibility and so many other important life skills, then it’s only natural that they will boost their confidence as they see their actions with the dog having an impact. From things like teaching the dog how to sit and fetch and stopping a puppy pulling everything in sight apart and other aspects of being in charge of training them and looking after them and seeing how rewarding that is, their confidence will soar, which is a great thing for a child because there are so many things out there ready to knock their confidence, so the earlier it’s instilled in them, the more it’s likely to stick and hopefully grow as they get older. Although a dog won’t talk back- at least not in a way a human talks, your child will spend a lot of time communicating with and learning from your dog, so they’ll be working on improving their speech, their vocabulary and overall social skills, such as empathy, listening for clues from the dog, and things like patience and being able to discipline the dog without violence - all of which are great social and life skills to have that will serve a bigger purpose as your child becomes an adult. As you can see, there are definitely a lot of ways that having a dog will benefit your child, but that doesn’t mean you should feel pressured into it if you know that your lifestyle simply won’t accommodate. You have to do what’s best for your family and for the dog, so don’t be tempted just to bring one into the house because you love animals and your child wants one. Easy to send online or through the mail ! The perfect gift for dog owners and families. These books show you how any pet dog can help in disasters and emergencies! This is a revised edition just released with over 50 more pages and available in paperback too! This book shows you how Any size dog from the little Chihuahua to the Great Dane can help its owner survive..and they find you every day already when they want to play or eat so why not learn what else they can do to help you ! how-to make a bug-out (survival) bag for owners and dogs. 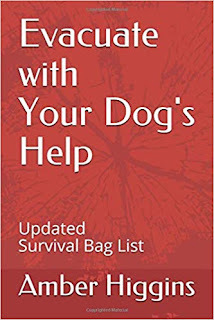 A detailed expanded list of survival items for pets and owners is included with step-by step instructions to teach your dog to carry a saddlebag to hold items to evacuate and "bug-out" with. Learn how Every dog any age or size can help its family evacuate. Be prepared for disasters with your pets. Learn what to expect at disaster shelters and from pet rescue during disasters. Print books ship in 1-2 days and gift wrapping is available! Free Shipping for the holidays ! Thinking of adopting a dog from your local shelter? Most people tend to choose younger dogs over older dogs, but this can lead to many older dogs never get rehomed. Here are a few reasons to consider an older dog to adopt. An advantage of adopting an older dog is that they’re generally already well trained. Most senior dogs are toilet trained, so you won’t have to go through the painstaking process of teaching your dog not to do its business indoors. A lot of senior dogs will also know basic commands such as sit, stay and come, so you don’t have to go through this teaching process either. As a result, senior songs can save you a lot of time and patience if you don’t want to go through the whole rigmarole of training. There’s a false belief that older dogs in shelters are only there because they’re ‘problem animals’, but this is completely untrue. Whilst there will be some dogs that were given up for adoption for being a little too wild, you’ll generally be able to gage which ones these are from the descriptions. The majority of older dogs in shelters are likely to be there because an owner passed away or simply neglected them – it’s rarely to do with the dog’s behaviour. Besides, dog shelter staff will generally invest some time into training for those that were untrained, so it’s rare you’ll ever find a completely unruly dog. Senior dogs also tend to have a calmer temperament. They’ve passed the naughty stage of puppyhood, which means you generally don’t have to deal with destructive behaviour and excessive yapping. Senior dogs tend to also have less energy – this means that you don’t have to deal with jumping and may not have to go on such extensive walks. 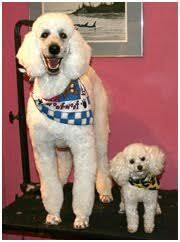 Many senior dogs are great around children because of their calmer temperament. They can also be great if you’re an older owner yourself who may not have the energy to deal with a more excitable young dog. Obviously temperament also has a lot to do with breed as well as the conditions they may have. There’s a belief that older dogs are more expensive for owners as the wear and tear of old age can often mean more health problems and hence more trips to the vets. Whilst it’s true that older dogs can be more at risk of health issues, this doesn’t always mean you’ll visit the vet more – after all, owners of young dogs often end up having to spend money on vaccinations and neutering, which an older dog is likely to have already received. Besides, if you get a young dog, they’ll eventually be an older dog and you’ll still have to deal with this greater risk of health problems one day. Pet insurance is harder to find for older dogs, but it does exist. Whilst some insurers are unwilling to take on older dogs due to pre-existing problems, there are other special insurers out there that offer pet insurance for pre existing conditions. Whilst your rates may be higher than a younger dog, you’ll still be able to cover yourself for an out of pocket treatment costs. It’s worth noting that older dogs also tend to cost less when it comes to food and toys. Whilst younger dogs tend to have a more voracious appetite and an ability to chew their way through toys fast, older dogs tend to have slower metabolism and a less destructive urge. The fact that there’s less demand for older dogs means that there’s often more choice for owners. When choosing a younger dog, you may restricted to only a handful of options at your local shelter. With so many senior dogs to choose from, there’s more variety when it comes to breeds and you can find a dog more suited to your personal preferences, whether you’re looking for a large breed or a small breed. If you had your heart set on a certain type of dog, you may have more luck of finding it by also extending your search to older dogs. Whilst younger dogs are likely to get snapped up by other owners, many older dogs never get chosen and can end up living out their last years in a shelter. Whilst shelters do the best they can to give dogs a good quality of life, nothing can replace the quality of life they’d get with an owner. By adopting a senior dog, you could help to give it a much more comfortable last few years on this earth by giving it that sense of belonging that every dog needs. In some cases, you could even extend a dog’s life by adopting it. Many dog shelters are on a tight budget and are overcrowded – once older dogs start to develop health problems, many shelters have to put these animals down in order to prioritize space and funds for healthier animals. Such dogs may have gone on to live for many more years had they got the treatment they needed. In other words, you could be saving an animal’s life by adopting a senior dog! You may not get as many years with an older dog – which is what puts off many owners – but that doesn’t mean it can’t be rewarding. 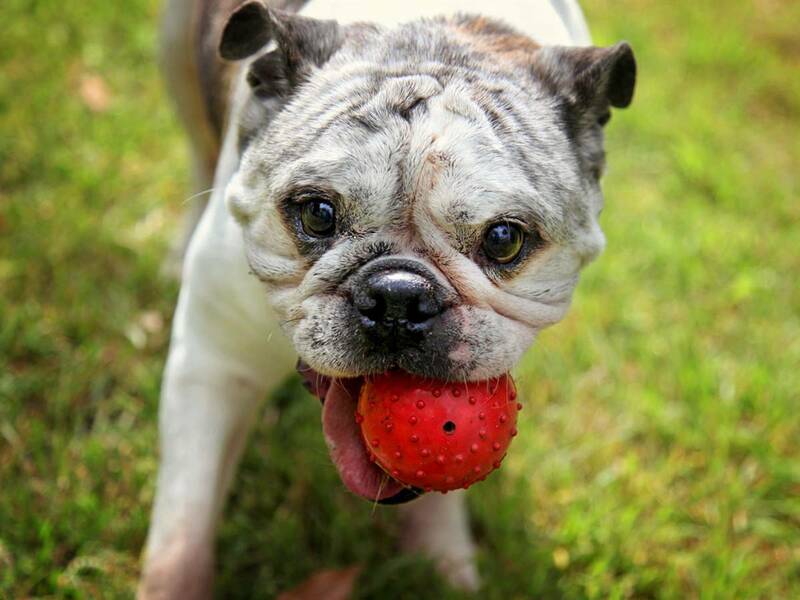 Many senior dogs can live on for years and years in a happy home. Group these three factors together on paper when you are planning a training course. Make a hand drawn map of the location and mark on the map the wind direction, buildings or landmarks, size of the search area and time of day you plan to train. Make a note of weather conditions. If you are training indoors you will modify these factors into the scene, for instance is there a fan or air conditioning system running? What chemical cleaners or odors do you smell or see in the area? What obstacles might be encountered or be in the way, closed doors, furniture or escape routes such as a window? Make a note of the subject you will be looking for, the person who will help you by hiding from your dog. Their weight, height, age, clothing and any health issues that might come into play during the course. Once your map is drawn of the location with the contributing factors that will affect the search you are ready to draw the trail you will work. I’ll tell you how I draw up my training courses so you have a better idea. I use a small dash line to mark where the person who we will be looking for will walk as they hide to draw the route I plan for them to take. I use X to mark the beginning and the end of the route. I draw the turns I plan to work the dog on with the training objectives in mind. Novice dog’s might only be working on one turn into the wind while an experienced dog can have 3 or 4 turns in different wind directions in the route. Make sure to have the turns flagged with a tissue paper piece. Tissue paper biodegrades so no worries about having to retrieve the flag after the training. I then decide where the trail layer or person will put the training flags or tissue paper along the route which will help me know my dog is working well. I use tissue or flags even on advanced dogs for my own benefit because these markers build my confidence in reading my dog. I put a small dot on my map for flags. Once I have the training course planned on paper I am ready to have the person help me make the course. I show my helper, the trail layer, the map and we use the map when we are making the trail or course. As they hide, they walk off from the starting point following the map while you wait knowing from the map where they are going. You dog will not see the map because they are usually asleep in the car. What time I wake my dog up to work the course will depend on the level of training my dog is at and how old the trail has aged. Levels are discussed in the next lesson Standards for Search Dogs. Aging the route is the next important step in training a family disaster dog in order for the dog to find people who have been lost for longer then a few hours. This lesson will be posted next.